Josh Bersin's presentation on 21st Century Talent Management: Imperatives for 2014 and 2015 highlights some of the following as the key areas where the biggest capability gaps exist: Leadership, Re-skilling HR, Talent Acquisition and Access, Talent and HR Analytics, Reinventing L&D, and so on. Each area is critical today in building an organization and an organizational culture that will not only attract the best employees but will also provide them with the necessary platform to give their best. An organization may attract the best and then lose them due to an overly repressive culture, a hierarchical structure or a closed environment. Today's employees are more focused on the three qualities of work defined by Daniel Pink in Drive: Autonomy, Mastery and Purpose. In this post, I am going to discuss the point on Reinventing L&D, one of the key capability requirements mentioned in the presentation. I have written about this here and here. And another related post on the Evolution of L&D... Here, I will explore the role of L&D in the VUCA (volatility, uncertainty, complexity and ambiguity) world. While we (L&D) keep talking about complexity and ambiguity and enabling learners to acquire the skills of "learning how to learn", we know that we need to transform and redefine ourselves and our role in the organization to add value to business. I am going to probe each of the aspects of VUCA and share my thoughts on what L&D needs to do. This is more of a #wol and thinking-aloud post. My thinking around this is not yet concretized. And I know it can't be. It's thinking in beta and only time and repeated experiments will tell what works in the VUCA world. However, one thing I am sure of is that we have to experiment, fail fast and learn from failures. The external conditions and environment are not going to stabilize enough for us to take a step back and come up with a solid plan and blue print of organizational learning. We'll have to become deft at designing as we go while keeping an eye on the big picture. This is where an understanding of what we need to bring to the table from on organizational and individual perspective keeping VUCA in mind may be useful. Volatility: Lack of stability is a given. Things will suddenly change. As L&D, we need to build in capabilities like agility, resilience and creativity. Not only in ourselves, but also in the organization. While some aspect of L&D will still be focused on skills training, we have to realize that skills training is the bare minimum required to get someone started or move to the next level. Knowledge and skills today have a diminishing shelf life and require constant rebuilding. Training is essentially past focused. People are trained to do certain tasks in ways that worked in the past; but there is no guarantee that it will continue to work in the future. Training is thus giving diminishing returns as days go by. These are mindsets, skills and attitudes that can be inculcated. I won't delve into the organizational culture required for these qualities to take root. That is a topic for another pots. However, by bringing awareness to the forefront, L&D can enable people to make wise choices. L&D can help build the skills at an organizational and an individual level. We can use an enterprise collaboration platform to facilitate working out loud, foster conversations, and encourage user-generated content. Working out loud facilitate sharing and making sense of the emerging patterns thus helping orgs and individuals to solve problems faster and more creatively. Working out loud is also a great sense-making mechanism--one of the key skills required today. The activities of sharing and connecting in turn help individuals learn from each other and move toward a self-driven, continuous learning mode. Of course, all of these not only take time but also commitment. Commitment from the organization, the necessary skill-sets within L&D and a culture based on transparency and trust. But the reality is that unless organizations move towards this kind of culture, there is little chance of survival. Complexity: I have written about complexity here (Adaptive Thinking, Deliberate Practice, and Complexity) and here (Wicked Problems, Complexity and Learning) and here. Ever since I stumbled across the Cynefin framework, complexity and emergence have fascinated me. But coming back to the point, what does L&D need to do in a complex world? Dealing with complexity requires Adaptive Thinking. Adaptive Thinking focuses on training how to think rather than what to think. Adaptive Thinking is different from lateral, creative or out-of-the box thinking. It is defined by the conditions under which it occurs. The conditions or constraints need to be taken into account and a solution sought within that. This is also the hallmark of a creative problem-solver, one who is unfazed by constraints but adapts herself/himself to get the maximum benefit out of the situation. Adaptive Thinking, as the term implies, indicates thinking while performing. This is different from thinking in an environment of calm reflection. This is why it becomes important to develop Adaptive Thinking skills through deliberation. Under conditions of stress, it is human nature to react automatically, using approaches that come most naturally and effortlessly. Ambiguity: Ambiguity can be scary and exhilarating depending on how we look at it. This quote sums it up beautifully! All of these can be great learning triggers if the skills of learning how to learn and self-driven learning have been fostered. Dealing with ambiguity also requires a natural curiosity and a questing attitude. In ambiguous situations, one is faced with "unknown unknowns" and has to be able come up with a solution. 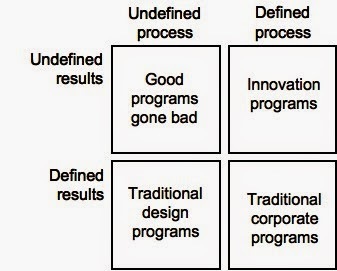 Here is a simple but quite effective matrix I found when researching ambiguity (http://instituteofdesign.typepad.com/d_log/2007/02/dealing_with_am.html). 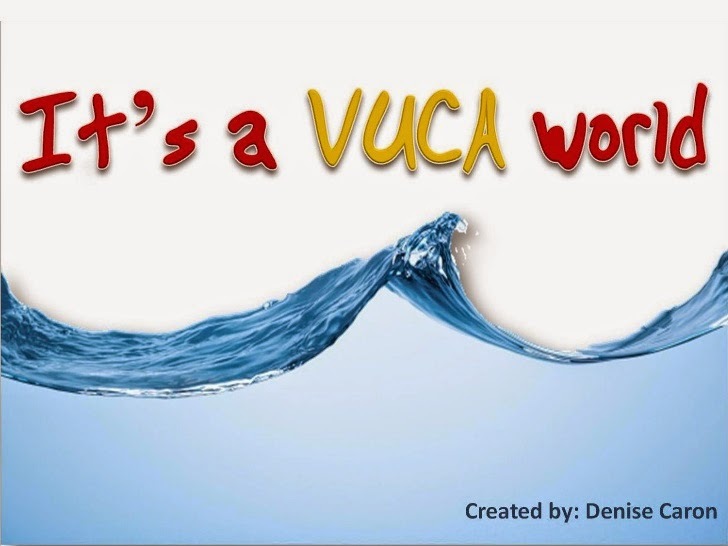 L&D has quite a few tasks to do and hats to don as we go about making sense of the VUCA world.